Sometimes boats are used as rescue vehicles. But, but far too often, boats are the vehicles being rescued - by hovercraft. Just ask Indiana's White River Hazleton Fire Department. Their Neoteric rescue hovercraft, and their flight training at Hovercraft Training Centers, enables them to save lives - and stranded boats - in areas no other vehicle can reach, such as shallow or fast-flowing water. As firefighter Mark Ellis says, "We're able to provide a service with the hovercraft that no one else can provide." The Department services a flood-prone area on the banks of three rivers including the White River, which drains 70% of the state. Chris Fitzerald, Hovercraft Training Centers' Senior Flight Instructor. MOUNT CARMEL- Wabash Emergency Management Agency (WEMA) had to call in Hazleton’s White River Water Rescue and its hovercraft to rescue a stuck pontoon boat on the Wabash River Monday morning. Shawn Lane, of Fairfield, and Bill Woodall, of Albion, went out to do some fishing before having engine troubles and becoming stuck south of the boat ramp by Twin Rivers Restaurant. Woodall said the motor stopped running and the pair drifted down river until they became stuck. Gerald Brooks, WEMA coordinator, said the depth of the river was so shallow that they couldn’t get a rescue boat close enough to the stranded craft to help. “Not the best thing to do, going out on the river when it’s this shallow,” he said. Initially, Brooks thought the people might have to be pulled from the craft, and a plan would have to be devised further down the road to tow the boat in. “The boat might have to sit there for a while,” Brooks said. 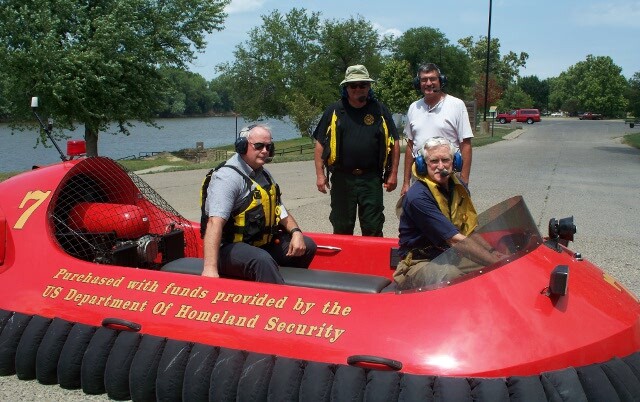 White River Water Rescue from Hazleton, Indiana was called in to assist with its hovercraft. Mike Ellis, White River Township Fire Chief, said the plan was to raise the motor on the pontoon boat out of the water, get the boat floating downstream and tow it to a downstream boat ramp. After raising the motor out of the water the boat began to drift down river before hanging up on another set of rocks. The passengers of the boat could be seen rocking the boat back and forth trying to break free. When that didn’t work, a tow rope was thrown from the pontoon boat to the hovercraft. With one of the passengers of each craft holding on to the rope, the hovercraft was used to break the pontoon boat free, and then tow it to a private boat ramp downstream.